This course provides an overview of organizational theory and the conceptual basis of traditional managerial and executive leadership roles in health care facilities. Emphasis will be placed on the application of theory and best practice standards to the demands of the business environment. Special emphasis will be placed on the development of leadership competencies and skills through the selection of a broad range of specialty topics including: The health system, strategic planning, organizational structure, organizational performance, organizational change, motivation, leadership, managerial problem solving, organizational communication and motivation. Students will gain an understanding of the organizational structure, function and processes of health care organizations in the USA. There will be an emphasis on financial and accounting functions in health care as well as a close look at organizational theory within health care systems. A systems perspective enables the student to understand and work with complex health care organizations and their changing environment. Students will develop an understanding of the requisite skills needed by health care executives, the role and functions of management, work processes, organization structure and function, their interrelationships with human factors, as well as methods for assessing organizational performance. Finally, students will learn about governance in the health care system and how organizations develop their missions. This is a general course in managerial epidemiology and infectious disease with emphasis on current topics and applications in the Public Health arena. Addresses the behavioral models of health and disease, the social barrier to care and the effectiveness of the health system in promoting optimal health behavior in patients and health care personnel as well as the organizations in which they work. Health care mangers are constantly surrounded by numbers that they need to manipulate and understand. Managing and interpreting health related indicators are important components of this course. The student is expected to gain a fundamental working knowledge of epidemiology methodology, infectious and emerging diseases and understand the influence of this field on other disciplines as well as the current and future topics facing health professionals today. A study of health and health status, and health assessment in the community is an important goal of this course. This course provides a critical overview of health policy, its development, implementation with emphasis on existing government programs and evolving changes. Emphasis will be placed on understanding the important health care policy issues of our times and how these policies drive the economics of the entire health care system in the United States. This course builds on the students' knowledge of theories and concepts gained in HSA 510 Principles of Health Services Administration. This course is designed to provide an understanding of the complex policy dynamics and challenges of an industry in a constant state of flux. Through readings, lectures, discussions, projects and case analysis students will learn fundamental principles of policy making. They will learn how to better utilize appropriate and effective management skills in their own organization. This course provides a critical overview of the delivery and economics of health care, with emphasis on existing government programs and evolving changes. Emphasis will be placed on understanding the important economic issues of our times and how these theories drive the economics of the entire health care system in the United States. This course builds on students' knowledge of theories and concepts gained in HSA510 Principles of Health Services Administration and HSA525 Health Care Policy which are both prerequisites. BUS513Economics Workshop will be also be required for students who not have taken an undergraduate Economics course. This course is designed to provide an understanding of the complex economic forces, dynamics and challenges of an industry in a constant state of flux. Through readings, lectures, discussions, projects and case analysis, students will learn fundamental principles of strategic planning. They will learn how to better utilize appropriate and effective management skills in their own organization. The provision of health care services is one of the most regulated industries in the United States. 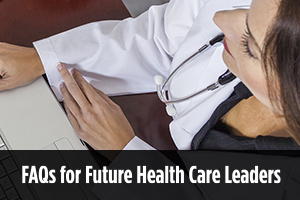 As the law and health care delivery become more interconnected, it is essential for those in the industry to keep pace with the significant changes in health law and their impact on the health care system. A strong background in health regulation is therefore becoming increasingly relevant to both clinical practice and to organizational management. Completion of this course will provide a basic understanding of such legal issues as civil liabilities including medical malpractice, professional fees splitting, self-referrals, and licensing, administrative and corporate law/governance pertaining to health services. Appropriate health administration requires not only understanding of applicable laws and regulations, but of the distinct ethical and social issues presented by the provision of healthcare services. Administrators, health professionals, patients and even communities as a whole are stakeholders in the ethical provision of health services. Qualified administrators and managers therefore are able to competently focus not only on the legal and business aspects of their field, but also on the social and behavioral aspects of the health administration from an ethical standpoint. This course therefore provides a practical and applicable framework to analyze the many complex issues and competing interests that arise in the modern healthcare industry. This course provides a survey of fundamental statistical concepts and applied techniques related to the practice of health services management. Methods of data collection, management, presentation, and descriptive and inferential statistics are included in this course, as well as research methodology theory applied to Public Health and Health Services. The course examines theoretical concepts, descriptive and analytic research methods that are used by the main disciplines engaged in research and evaluation of health status and health services. This course provides a foundation for the implementation of quality management activities in the health care industry. Examines theory, methods, and assessment tools health care managers and health professionals currently use, creating an environment in which quality can be measured and improved. The course introduces the process of performance improvement as continuous and dynamic through process design, data collection, analysis, implementation, and ongoing evaluation. This course examines the complex financial systems within today's healthcare environment and provides an understanding of the basics of health insurance and public funding programs, managed care contracting, and how services are paid. This gives the student an appreciation for the complexity of reimbursement systems and an understanding of the profound impact they have had on providers and payers, consumers, public policy makers, and the development of classification and information technology systems over the years. This course provides a comprehensive overview of the organization of the health care system and the proposals for system reform; it focuses on financing in the public and private sectors, gaps in the system, and the integration of financing and delivery mechanisms. This course is designed to provide the student with an understanding of the health system from a general systems perspective. This perspective will enable the student to understand the complex nature of health system organization and to analyze our current situation. Students will develop an understanding of the structure and function of health systems financing, as well as the interrelationships among the component parts. The topics include the types and nature of various health system processes and institutions; how they evolved; their current status and possible future development. This course provides an examination of management policies and practices in the administration of long-term care facilities designed for the rapidly growing senior population. Emphasis will be placed on the application of theory and best practice standards to the demands of the business environment. Special emphasis will be placed on the development of leadership competencies and skills through the selection of specialty topics unique to this healthcare industry segment. These include licensure, planning, organizing marketing, staffing and directing complex, multicultural health care organizations, which serve a geriatric population with specific needs. In order to properly manage their assigned areas of responsibility, managers must have an understanding of the various financial management concepts and tools that are available to them to successfully accomplish their assigned tasks. They must be able to identify the sources of revenue and recognize the expenses that have an impact on their areas(s) of responsibility, and master the techniques associated with managing this information. Decisions involving financial and human resources must be based on managers' overall understanding of the organization's mission, goals, and objectives. Good managers work diligently to coordinate their areas of responsibility with their peers, who are managing other diverse areas of the organization. This course will introduce students to the basic concepts and principles of financial management within healthcare organizations. The focus of the course will be how health care managers utilize financial data to better manage their organizations through an enhanced decision-making process. This course is designed to provide the student with an understanding of how health care administrators and managers use financial information to help guide and manage organizations. Students will learn fundamental principles of financial and managerial accounting. They will examine how to better utilize financial information in their own organization. Students who have never taken an undergraduate finance or accounting course will be required to complete BUS 512W Accounting Principles Workshop and BUS514W Finance Workshop. A survey of the managed care continuum in the United States is presented. The concepts of risk and control are studied with particular focus on the management and organizational challenges involved with the continued growth of managed health care. This course includes such topics as managed care contracting, network strategy, integrated delivery systems, care management, disease management, quality, claims, and consumer affairs. In addition, Medicare and Medicaid are examined from a managed care perspective along with the legal, operational, and regulatory environments. Analyses of the theories and principles of performance improvement and quality assurance. Introduces the process of performance improvement as continuous and dynamic through process design, data collection, analysis, implementation, and ongoing evaluation. Explores tools utilized for quality assurance. This course provides an introduction to the concepts and principles of research and program evaluation from a systems perspective. It examines the strengths and weaknesses of various research designs and evaluation approaches using both qualitative and quantitative methods. Students will develop a program evaluation proposal as a part of the course requirements. Students will learn how to apply research methodology to successfully address healthcare issues in complex business situations. Advanced supervised field operation and experience in an approved health care administration setting. Required for students with less than five years health care work experience. Optional for all other M.S./H.S.A. students. Prerequisites: HSA 510, 610, or permission of the Program Director. A specialized area of study with a faculty member on selected topics in which formal coursework is not offered. Assigned readings, reports, weekly discussions and examinations by arrangement with instructor. Prerequisite HSA510 and HSA610. Provides an overview of leadership perspectives and strategies as they apply to health care settings. The course is designed to provide a working knowledge of leadership theory and processes, emphasizing the leader's human resources function in health care settings. Students will develop an understanding and appreciation of how effective health care leaders think, make decision and solve problems, and accomplish corporate strategy through maximizing employee commitment and other organizational resources. Also, the course endeavors to facilitate self-knowledge and career planning as well as skill development related to health care leadership, particularly skills in gaining commitment, coaching for performance and developing employees. The processes of managing and developing human resources, complying with professional and governmental regulations, and monitoring policies and culture of the health care organization to maximize productivity, health and job satisfaction are explored. The course is designed to provide a working knowledge of a leader's human resources function in health care settings. Students will develop an understanding and appreciation of how health care leaders effectively and efficiently manage the human resource function within their organization. Medical group practices are developed to assume and manage the economic risk inherent in health care. This course provides an overview of the complex processes involved in developing a viable organization, and emphasizes the application of theory and best practices to the demands of this business environment. An in-depth focus will be placed on the strategic components required to build a successful structure, the requisite ongoing operational assessments and the methodologies used to effect change. Healthcare is an information-intensive process. High-quality patient care relies on careful documentation of each patient's medical history, health status, current medical conditions, and treatment plans. Management and financial information is essential for strategic planning and efficient operational support of the patient care process. A strong argument can be made that the healthcare industry is one of the most information-intensive sectors of the economy. This course examines the use of health information systems to support various healthcare functions. Emphasizes the health services administrator's use of information systems to integrate clinical, financial and human resources data and to support managerial decision-making. Focuses on the selection, management and evaluation of various health care information systems. This course is designed to provide a broad overview of the need, selection and use of information systems in health care organizations. Students will develop an understanding of the needs of health care systems and gain familiarity with various technologies to manage those needs, including management information systems, clinical outcomes systems, and electronic patient records. This is a core course required for all nursing and health services administration master's degree-seeking students. Content focuses on recognizing, understanding, and respecting health beliefs and practices of individuals, families, and communities. Health care disparities are addressed through a comprehensive review of evidence-based health care guidelines. Managers must have an understanding of the various marketing concepts and tools that are available to them to successfully accomplish their assigned tasks. Decisions involving marketing must be based on a manager's overall understanding of the organization's products and services. Effective managers work diligently to coordinate their areas of responsibility with their peers, who are managing other diverse areas of the organization. This course provides methods to evaluate marketing performance and productivity, analyze internal and external resources, and perform a SWOT analysis; present various models and methods for the promotion and positioning of health care services and products. It also emphasizes the importance of a marketing audit and incorporating that audit into the total marketing planning process. The course will also review the importance of marketing research and the analytical tools required to be successful. In order to properly manage their assigned areas of responsibility, managers must have an understanding of the various strategic management concepts and tools that are available to them to successfully accomplish their assigned tasks. Decisions involving strategy and marketing must be based on managers' overall understanding of the organization's mission, goals, and objectives. Effective managers work diligently to coordinate their areas of responsibility with their peers, who are managing other diverse areas of the organization. This course provides methods to evaluate organizational performance and productivity, analyze internal and external resources, and perform needs assessment. The course also presents various models and methods for planning and positioning of health care services and interpreting surveys used in health services management information systems. It also emphasizes the importance of creating a strategic plan and incorporating that plan into the total strategic planning process. This course represents the program capstone that integrates all previous courses.